I was pretty new to EMS when I was assigned to transfer a patient from one hospital to another. The patient had something called “Mersa” and looked nasty – bumps and boils and weeping sores. I knew that Ebola was named after a river in Africa where it was first found and Lhasa fever had a similar story. So I thought that “Mersa” was a hemorrhagic fever named after the Mersa River. There must be a Mersa River in the Congo or something. Weird that this guy had it in Colorado. The most screwed up part of that story is that I transported him from one hospital to another without an astronaut’s space suit between him and me. I just had a gown, gloves, and glasses. Even that was only because the nurse insisted I wear a gown. I was much dumber in my youth. It was much later that I learned that the poor guy’s disease wasn’t “Mersa,” but MRSA. Methicillin-resistant Staphylococcus aureus. S. aureus is a pretty common bacteria, and overly aggressive prescribing of antibiotics combined with not taking all the prescription has resulted in antibiotic resistance. There are two kinds of MRSA. Healthcare-acquired MRSA (HA-MRSA) infections are usually associated with hospitals and nursing homes and usually involve invasive procedures and devices like catheters. Populations at risk for HA-MRSA include the sick, the hospitalized, and patients who reside in long-term care facilities. 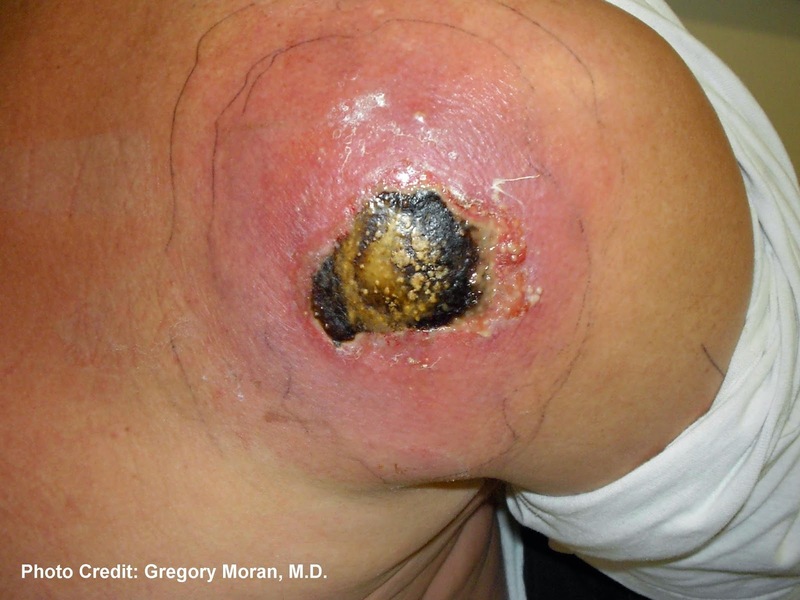 Community-acquired MRSA (CA-MRSA) occurs in otherwise healthy people and is spread by skin-to-skin contact. So contact sport athletes, childcare workers, and people in crowded conditions (jail, military, etc.) are more at risk. Both kinds of MRSA are resistant to methicillin antibiotics. Those are most of the more common antibiotics that are prescribed and include most of the penicillins, amoxicillin, and most cephalosporins. 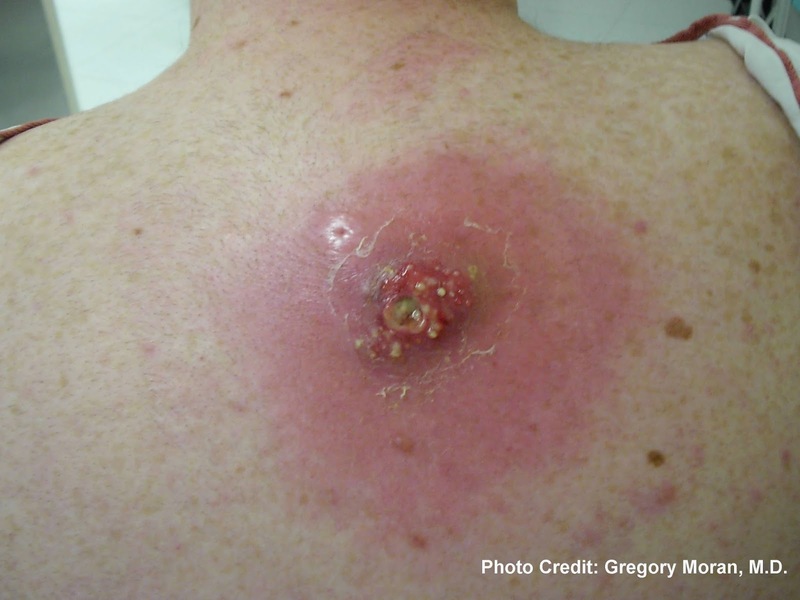 MRSA contamination can be asymptomatic, but an infection usually begins as small red bumps that look like pimples or a spider bite. Within a few days, those pimples grow to larger, painful boils and eventually abscess. Most MRSA infections remain confined to the skin and superficial tissues. In some patients, though, as the bacteria burrow into the patient, joints, bloodstream, and heart valves can become infected. 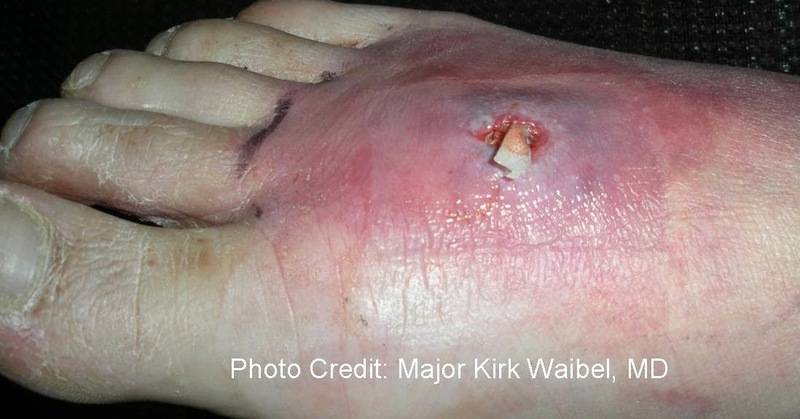 Without treatment, MRSA can progress to necrotizing fasciitis, infective endocarditis, and necrotizing pneumonia. CA-MRSA responds better to antibiotics, including sulfa drugs, clindamycin, and tetracyclines. HA-MRSA is resistant to most of those, however. So the treatment of choice now has become vancomycin. New drugs (linezolid, daptomycin, and ceftaroline) are also approved for MRSA treatment. So how is MRSA infection prevented? It is embarrassingly simple: handwashing, surface disinfection, and covering any wounds or scrapes you may have. That’s about it. So let me ask you, how often do you wear gloves throughout the patient contact? How often do you disinfect or wash your hands? When was the last time you disinfected your stethoscope? Or the blood pressure cuff? Worse, consider who had your ambulance last. Did they do those things? If you say always or pretty much always, I can call you a liar and be statistically correct more often than not. Tons of studies show that we are horrible about those things. EMS providers are bad at standard precautions. We are in denial about it. A 2014 study looked at 423 EMS deliveries to an ED and watched what the 899 providers were doing. (1) Only 57% arrived wearing disposable gloves. Under 30% washed their hands. Just over 30% disinfected at least one piece of equipment (washed blood off the stretcher, usually). Y’all are nasty. Another just-published study watched for handwashing among paramedics. (2) It isn’t a strong study, using paramedic students to watch medics in a convenience sample and only collected about half of available employees in 258 calls over 6 months. Only about 62% washed their hands. About 1% sanitized their hands before patient contact. Only about 20% washed their hands before meals. You all are nasty. Alves and Bissell randomly selected four ambulances and swabbed five locations in each to check what kind of pathogens grew. (3) They isolated seven species of bacteria. Four of the species were “substantial pathogens” and three of those four had significant antibiotic resistance. Y’all are nasty. In 2007, a group of researchers swabbed 21 ambulances and almost 50% tested positive for MRSA. (4) Y’all are nasty. Another group of authors grabbed fifty consecutive stethoscopes that walked in through the ambulance doors to an ED and swabbed them. (5) Sixteen of the fifty had MRSA – that is almost one third of stethoscopes being positive for MRSA. The same number of medics couldn’t remember when they cleaned their stethoscope last. Y’all are nasty. Speaking of Staph on stethoscopes, a 1995 study surveyed nurses, doctors, and EMS providers about stethoscope cleaning and swabbed their stethoscopes. (6) Only half of providers cleaned the piece of equipment they hang around their necks daily or weekly. 89% grew Staph and 19% grew S. aureus. The two pieces of good news in this study is that there were no differences between provider types and a simple alcohol swab reduced the bacterial load by 94%. Y’all are nasty. Sorry to keep beating the dead horse, but y’all are nasty and need to hear this. So let’s just do one more. A 2013 study swabbed the nasal cavities of EMS personnel. (7) Five percent tested positive for MRSA. That’s right – if this extrapolates to the wider EMS community, 5% of your coworkers sneeze out MRSA onto the steering wheel and dash. The 5% rate is about five times the general public rate. Y’all are nasty. That statement comes from my own experience, as well as tons of studies like the ones listed here. Start to pay attention to how often your partner washes their hands. So let’s do each other (and ourselves) a favor. Clean. Wash your hands. Disinfect surfaces in the ambulance. Clean your stethoscope. Do the simple things and remind your partner to do the same. Start to instill those habits in students. Our coworkers, our patients, and our families deserve a little more in the way of cleanliness. Because MRSA, while nasty, is only one kind of infection that we have to deal with. 1. Bledsoe BE, Sweeney RJ, Berkeley RP, Cole KT, et al. EMS provider compliance with infection control recommendations is suboptimal. Prehosp Emerg Care 2014;18(2):290-4. 2. Ho JD, Ansari RK, Page D. Hand sanitization rates in an urban emergency medical services system. J Emerg Med. 2014;47(2):163-8. 3. Alves DW, Bissell RA. Bacterial pathogens in ambulances: Results of unannounced sample collection. Prehosp Emerg Care 2008;12(2):218-24. 4. Roline, CE, Crumpecker, C, Dunn, TM. Can Methicillin-resistant Staphylococcus aureus be found in an ambulance fleet? Prehosp Emerg Care 2007;11(2):241–244. 5. Merlin MA, Wong ML, Pryor PW, Rynn K, et al. Prevalence of Methicillin-resistant Staphylococcus aureus on the stethoscopes of emergency medical services providers. Prehosp Emerg Care 2009;13(1):71-4. 6. Jones JS, Hoerle D, Rieske R. Stethoscopes: A potential vector of infection? Annals Emerg Med. 1995;26(3):296-9. 7. Miramonti, C, Rinkle, JA, Iden, S, Lincoln, J, et al. The prevalence of Methicillin-resistant Staphylococcus aureus among out-of-hospital care providers and emergency medical technician students. Prehosp Emerg Care 2013;17(1):73–77. As a Student, I am eternally grateful for this post. None of my preceptors thus far wash their hands...like, ever, in 10 hours. I hope they wash in the bathroom. Thank you so much for this post. As a P-student I have yet to see a preceptor out of hospital wash their hands...not once, ever. Y'all are nasty.